Jacksonville, FL (WorkersCompensation.com) - One Call, the nation's leading provider of specialized healthcare solutions for the workers' compensation industry, today announced new, impressive results that demonstrate how RelayRIDESM, the innovative addition to its transportation program, helps reduce missed medical appointments. RelayRIDE works to solve this problem via proprietary technology that automatically assigns sedan transportation referrals through the rideshare platform Lyft, if the injured worker is in a Lyft coverage area. RelayRIDE features real-time monitoring with automated alerts thereby proactively enabling One Call to mitigate potential service disruptions – such as appointment ‘no shows' – by contacting the injured worker while dispatching another driver. Historically, payers' only option was to coordinate transportation through a traditional transportation provider, typically charging minimum mileage fees, rush fees and wait time charges. 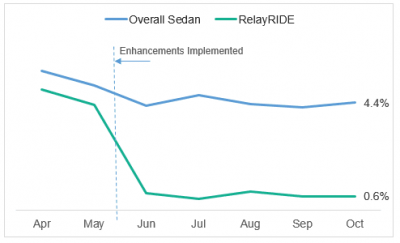 RelayRIDE eliminates these fees, providing significant savings to customers. For injured workers with more critical needs – such as access to a wheelchair, stretcher, or life support – RelayRIDE is not the answer at this time, but for many, it's a very viable solution.